Our unique House Shape Address Plaque is popular with Airbnb's and Bed & Breakfasts. Includes five lines for your personalized wording. Custom made in USA. Wall mount. 12"W x 9"H.
Sturdy, UV-stabilized, non rusting laminated acrylic plastic construction with engraved wording and border. Up to five lines available for your personalization. Use as many or as few lines as you desire. Lines 1 and 2 can each hold up to twenty (20) 1" characters. Lines 3, 4, and 5 can each hold up to twenty six (26) .625" characters. Please leave any extra input box lines empty. Dimensions (approximate): 7"W x 3.5"H x 1/8". 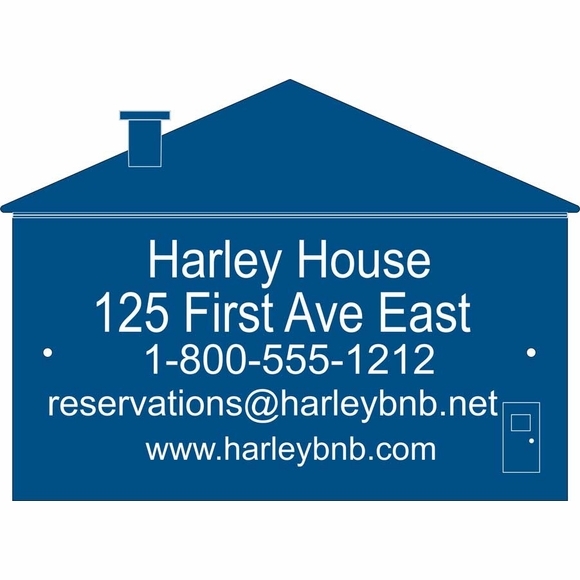 Unique House Shape Address Plaque is popular with Airbnb's and Bed & Breakfasts.